For example, using our crystal, which has a 7.995-MHz fundamental frequency, a net change of 1 Hz corresponds to 1.34 ng of mass adsorbed or desorbed on a crystal surface of area of 0.196 cm2. QCM in conjunction with electrochemistry (EQCM) has been widely employed for the determination of metals deposited onto the crystal, studies of ion-transport processes in polymer films, biosensor development, and investigations of the kinetics of adsorption/desorption of adsorbate molecules. In EQCM experiments, measurements of various electrochemical parameters, such as potential, current, and charge at the working electrode, are conducted simultaneously with the acquisition of the corresponding frequency and resistance changes, using the experimental setup shown in Figure 1a. For any model in the 400C series, the application of a specific potential waveform (e.g., triangular potential waveform for cyclic voltammetric experiments), current measurement, and frequency counting are carried out with a potentiostat/frequency counter, which is in turn controlled by a computer. Figure 1. Schematic representation of a typical EQCM instrument. (a) The quartz crystal has a fundamental frequency of 7.995 MHz and is coated with thin gold films on both sides. The gold disk deposited on the top side of the crystal is in contact with the electrolyte solution and used as the working electrode. The top view of the gold-coated crystal is also shown. (b) Edge view of QCM crystal showing shear deformation. 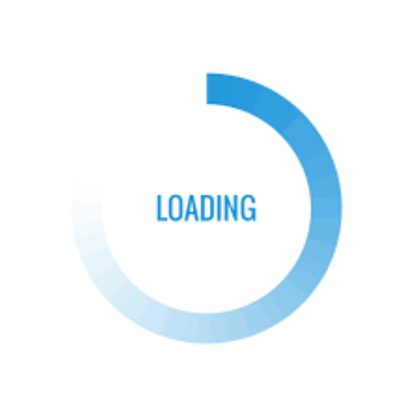 The disk thickness and shear deformation have been exaggerated for clarity. The 400C series contains a quartz crystal oscillator, a frequency counter, a fast digital function generator, high-resolution and high-speed data acquisition circuitry, a potentiostat, and a galvanostat (Model 440C only). The QCM is integrated with the potentiostat and galvanostat, to facilitate simple and convenient EQCM studies. Instead of measuring the frequency directly, the 400C series uses a time-resolved mode as follows. The observed frequency signal of the QCM is subtracted from a standard reference frequency, and the resulting difference is measured by a reciprocal technique, greatly reducing the required sampling time and yielding much better time resolution for the QCM signal. With direct counting, a 1 Hz QCM resolution requires 1 second of sampling time, 0.1 Hz resolution requires 10 seconds, etc. In contrast, our time-resolved mode allows the QCM signal to be measured in milliseconds with much better resolution. The potential control range of the instrument is ±10 V and the current range is ±250 mA. In addition to QCM and EQCM measurements, the instrument is capable of a wide range of techniques, and is suitable for general-purpose electrochemical applications. The instrument is very sensitive and very fast, capable of measuring current down to the picoampere level. The scan rate in cyclic voltammetry can be up to 5000 V/s with a 0.1 mV potential increment or 10000 V/s with a 1 mV potential increment. 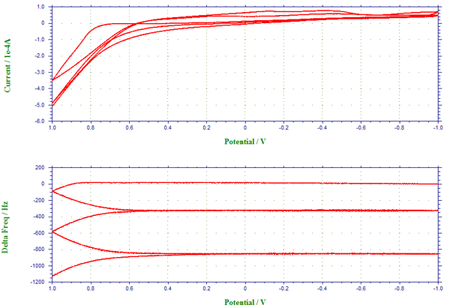 Figure 2 shows the voltammogram of underpotential and bulk depositions of Pb from a 0.1 M HClO4 solution containing 1 mM Pb2+, and the corresponding frequency changes have been plotted as a function of the applied potential. In Figure 2a, the cathodic peaks at –0.28 V and at ca. –0.59 V have been assigned to the underpotential deposition of monolayer Pb and the bulk deposition of multlayers of Pb, respectively, whereas the anodic peaks at –0.41 V and at –0.28 V are attributable to the stripping of the deposited Pb. The frequency-potential diagram (Figure 2b) displays the frequency decrease due to the deposition of monolayer Pb (about 25 Hz or 33.5 ng between –0.28 V and –0.59 V) and the more drastic frequency decrease arising from bulk Pb deposition (a net change of 425 Hz or 573.8 ng at ca. –0.5 V). Figure 2. 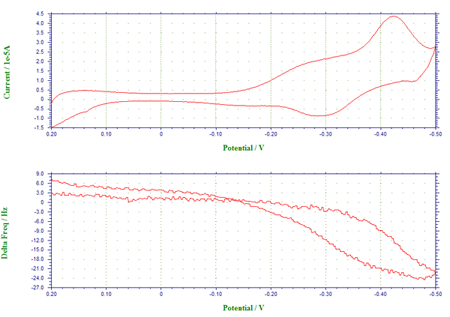 Voltammogram and QCM data of Pb underpotential deposition. Scan rate = 0.05 V/s. Fig. 2a: cathodic peaks = –0.28 V , –0.59 V. Anodic peaks = –0.41 V , –0.28 V. Fig. 2b: frequency-potential diagram displays the frequency decrease due to the deposition of monolayer Pb and the more drastic frequency decrease arising from bulk Pb deposition. 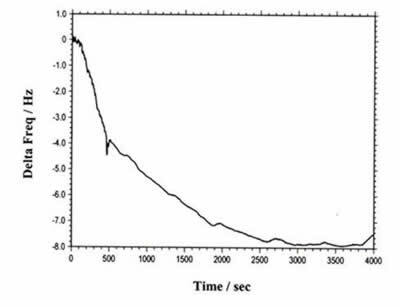 Figure 3 depicts the voltammogram of the oxidation of pyrrole to form polypyrrole film at the gold-coated crystal and the corresponding frequency change. Five scan segments between the lower limit of –1.0 V and the upper limit of 1.0 V were conducted in this experiment. As clearly shown in Figure 3a, pyrrole monomer can be oxidized to its radical at ca. 0.65 V. When this occurred, a thin polypyrrole film was formed, resulting in a decrease of the fundamental frequency of the quartz crystal (Figure 3b). During the first potential cycle, the net frequency change was found to be 1150 Hz. In each cycle, the oscillation frequency reached a steady value once the potential became insufficiently positive for the oxidative deposition of polypyrrole film. 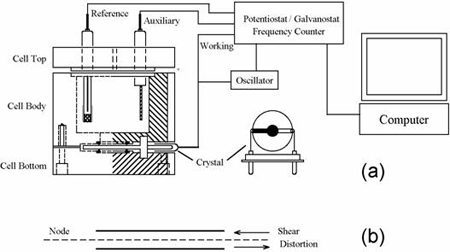 The subsequent potential cycles displayed in Figure 3 demonstrate the continued growth of polypyrrole film, with the deposited mass causing the crystal oscillation frequency to decrease further. A fast scan rate (0.1 V/s) was employed. Figure 3. Voltammogram and QCM data of oxidation of pyrrole to form polypyrrole film. Scan rate 0.1 V/s. Fig. 3a: pyrrole monomer can be oxidized to its radical at ca. 0.65 V. Fig. 3b: decrease of the fundamental frequency of the quartz crystal at 0.65V. The instrument can also be used to perform standard QCM measurements. Figure 4 shows QCM data for a flow cell detection experiment. The total frequency change observed was less than 8 Hz, with extremely low long term drift and noise levels. The model 400C series is the upgrade to the model 400/400A/400B series. The new design provides more stable and accurate potential control (1 mV, 0.02%), and it also allows the resistance change and frequency change to be measured simultaneously. Figure 4. A typical flow injection-QCM experiment. As soon as the sample is injected, the QCM starts recording the frequency change (t = 0). The pump is stopped at 460 s (where a small glitch on the curve can be seen). The reaction is completed about 40 min after sample injection. The total monitoring time is over 1 hr. A net change of 8 Hz is monitored. After 40 min or so, the frequency becomes very stable again (for at least more than 20 min, the frequency drift is much less than 1 Hz). The 400C series has a USB port (default) and a serial port for data communication with the PC. You can select either USB or serial (but not both) by changing a switch setting on the rear panel of the instrument. The EQCM cell consists of three round Teflon pieces (Figure 1a). The total height is 37 mm with a diameter of 35 mm. The top piece is the cell top, which holds the reference and counter electrodes. There are also two 2 mm holes for manual purging. The center piece is the solution cell, and the bottom piece is for mounting purposes. Four screws are used to tighten an O-ring seal between the bottom and center pieces, with the quartz crystal sandwiched between them. The diameter of the quartz crystal is 13.7 mm. The gold electrode diameter is 5.1 mm. $: Phase selective data are available.